Golar LNG's shares had a nice tailwind in August thanks to its joint venture with Schlumberger. Shares of Golar LNG (NASDAQ:GLNG) rose a whopping 26% in August. The company reported earnings on August 24th to not much fanfare, but the big reason that Golar LNG's shares took off so much was it was riding the good vibes from the announcement of its OneLNG joint venture with Schlumberger (NYSE:SLB). On July 25th, Golar and Schlumberger announced they would create a joint venture called OneLNG. The objective of the project is to help monetize natural gas reservoirs that are categorized as stranded. Basically, they are significant resources, but not large enough to justify large, stationary LNG facilities. Golar's floating LNG facilities will be marketed in conjunction with Schlumberger's production management services such that companies can monetize these stranded gas assets. As investors and analysts had time to digest this news, it appears that they are happy with the result. 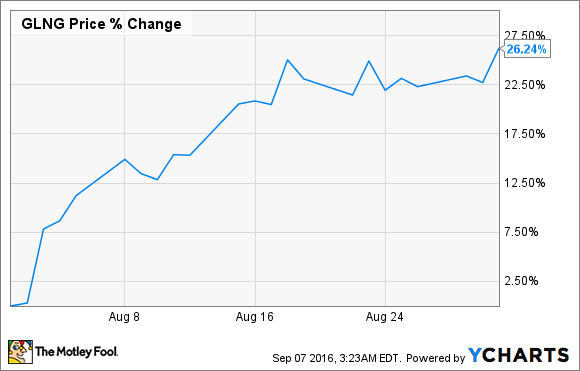 On August 1st, Bank of America upgraded the company's stock to buy. On August 25th, the company released its earnings. Like so many before them, they were a bit underwhelming. The company is still shelling out large amounts to pay for ether new construction or for the conversion of its older vessels into floating LNG facilities. It also doesn't help that the company's utilization rate for assets remains low at just 31%. Over time, though, this OneLNG joint venture and the other joint venture it signed with Stonepeak Infrastructure Partners back in June will help the company access financing for the development of its vessels as well as help market its fleet. Shares of Golar LNG have taken a big hit ever since the oil and gas industry turned south in 2014, but the signing of these two deals will certainly help the company meet both its short term needs for financing and its long term objectives of marketing its vessels. For investors, though, it may be worth sitting back for a bit to see how these joint ventures have an impact on the bottom line. Keep an eye on upcoming earnings results to see if the company is able to increase its utilization rates. That metric will be the key to higher revenue and a turn toward profitability.